shopnewbalance.com: New Balance - New Launch - One Day Away! New Balance - New Launch - One Day Away! 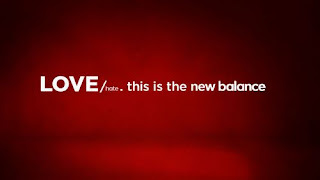 Tomorrow evening during the NCAA Basketball Tournament, New Balance is set to launch; "LOVE/hate. this is the New Balance." According to many sources/articles, this is part of a plan to "double athletic footwear and apparel sales in part by tripling the company's spending on marketing." The campaign depicts every athlete's struggle with their own relationship with running. Running makes you a better athlete, but not every athlete likes to run. That is where New Balance comes in; their mission is to make you LOVE running more with innovative products and exciting technologies. We'll be in the front of the TV watching and waiting tomorrow. If you catch the spot, let us know! Love the new ad campaign - great feel and concept.